Yes, it’s capital K, small r.
Appearance: Dark gray to grayish-green, nearly circular top shell (carapace). Pale yellow to cream-colored bottom shell (plastron). Diet: Crabs, shrimp, fish, jellyfish, and mollusks (clams and snails). Feed the shallow coastlines (150 feet/46m) or less (mud, sands, and estuaries where these food species grow and mature). Range: Primarily Gulf of Mexico, but also the Caribbean Sea to the North Atlantic. After nesting, females migrate to the rich feeding grounds off the Louisiana coast. 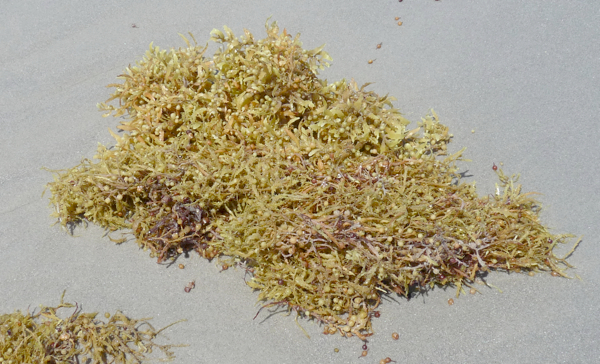 Hatchlings ride on Sargassum sea grass clumps for safety from predators and because their early meals — small crabs and snails — float with them. The grass floats in the “drift lines” between currents or where currents converge, either holding these floating critter barges in the Gulf of Mexico, or sending them into the Atlantic Ocean. Some Kemp’s ridleys are carried by the Gulf Stream across the Atlantic to Europe–the Azores, British Isles, France, even the Netherlands. Juveniles (min. age 2) also feed along the east coast of the United States: Chesapeake Bay, Delaware Bay, Long Island Sound, off Cape Cod, all the bays along the New Jersey shores. 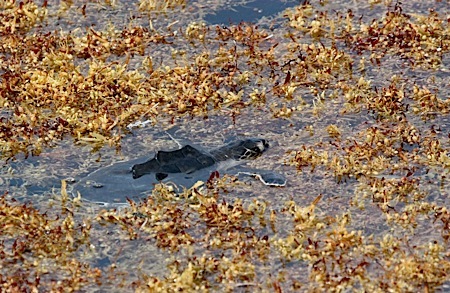 In the fall, juveniles leave the northern and southern Atlantic (Carolinas and Georgia) and travel south for the winter. If they leave too late, they risk becoming “cold-stunned” as temperatures drop. Reproduction: The primary nesting beach is Playa de Rancho Nuevo, Tamaulipas, Mexico, with scattered sites along the Mexican and Texas Gulf coasts. It takes 10-15 years for a female to reach sexual maturity. Little is known about males. Adult females migrate in shallow waters, but rarely leave the Gulf. 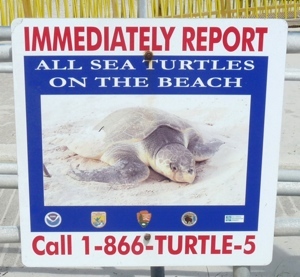 Adult males do not migrate, but stay near nesting beaches year-round, never coming ashore. Mating begins in April. Nesting is typically April-June. 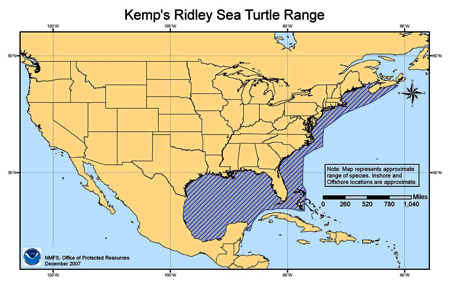 Kemp’s ridleys are the only daytime-nesting sea turtles. Females nest an average of every 1.5 years and up to 3 clutches a season. The resting period between nests is 20-28 days between. Clutches average 110 eggs, each egg weighing 1.1 oz/30g. 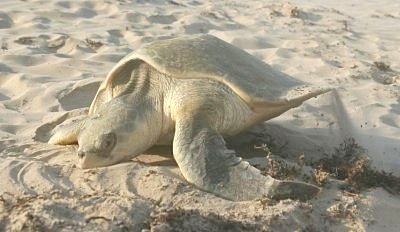 Nesting takes 45 minutes to an hour, ending with the “ridley dance.” The turtle swipes sand over the eggs with her back flippers until the hole is filled. She then rocks back and forth, tamping down the sand to further disguise the nest. 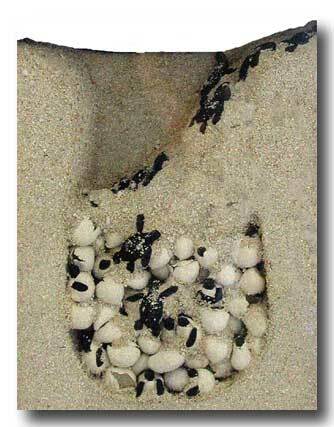 Hatchlings emerge at night after 50-60 days incubation. 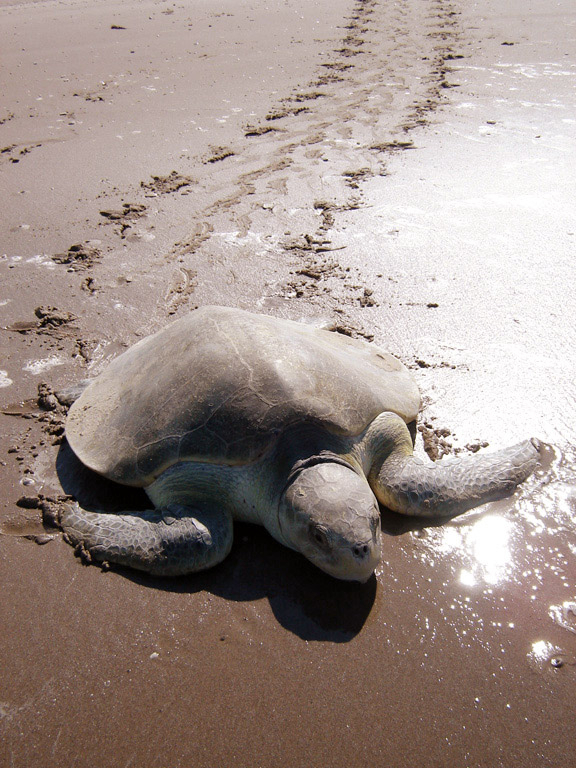 The main Kemp’s ridley nesting beach is Playa de Rancho Nuevo, Tamaulipas, Mexico, with a growing number of nests laid on Padre Island and South Padre Island, Texas, thanks to the “headstart” program begun in 1978. Because the species is so critically endangered, few nests incubate naturally. Extensive programs in Mexico and the U.S. find and relocate eggs into protective enclosures to ensure the highest rate of hatch success. Lifespan: Unknown, but could be 30-50 years. Personality: Kemp’s ridleys may be the smallest of the world’s sea turtles, but there is nothing small in their attitude. They fight when captured, are known to bite, and are too aggressive with each other to be kept together in the same enclosure for long.